Additional public affairs contacts: Richard Lewis, Brown University, Providence, R.I., 401-863-3766 or richard_lewis@brown.edu. Rachel Prucey, NASA Ames Research Center, Moffett Field, Calif. 650-604-0643 or rachel.l.prucey@nasa.gov . 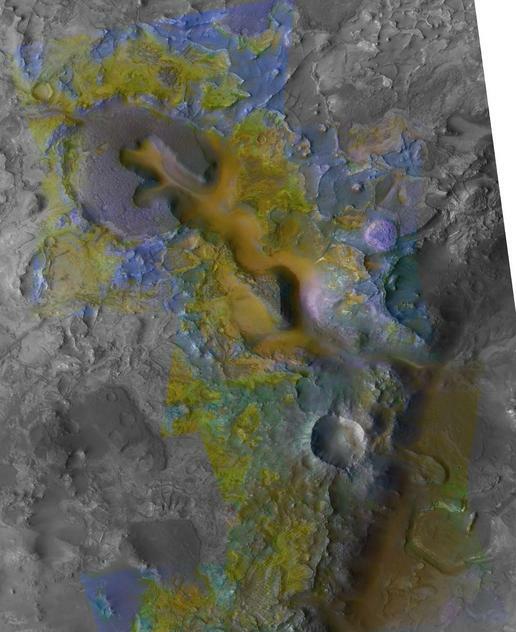 The color coding on this composite image of an area about 20 kilometers (12 miles) wide on Mars is based on infrared spectral information interpreted as evidence of various minerals present. Carbonate, which is indicative of a wet and non-acidic history, occurs in very small patches of exposed rock appearing green in this color representation, such as near the lower right corner. The scene is heavily eroded terrain to the west of a small canyon in the Nili Fossae region of Mars. It was one of the first areas where researchers on the Compact Reconnaissance Imaging Spectrometer for Mars (CRISM) science team detected carbonate in Mars rocks. The spectral information comes from infrared imaging by CRISM, one of six science instruments on NASA's Mars Reconnaissance Orbiter. That coloring is overlaid on a grayscale image from the same orbiter's Context Camera. The uppermost capping rock unit (purple) is underlain successively by banded olivine-bearing rocks (yellow) and rocks bearing iron-magnesium smectite clay (blue). Where the olivine is a greenish hue, it has been partially altered by interaction with water. The carbonate and olivine occupy the same level in the stratigraphy, and it is thought that the carbonate formed by aqueous alteration of olivine. The channel running from upper left to lower right through the image and eroding into the layers of bedrock testifies to the past presence of water in this region. That some of the channels are closely associated with carbonate (lower right) indicates that waters interacting with the carbonate were neutral to alkaline because acidic waters would have dissolved the carbonate. Information for the color coding came from CRISM images catalogued as FRT0000B438, FRT0000A4FC, and FRT00003E12. This composite was made using 2.38-micrometer-wavelenghth data as red, 1.80 micrometer as green and 1.15 micrometer as blue. The base black-and-white image, acquired at a resolution of 5 meters (16 feet) per pixel, is catalogued as CTX P03_002176_2024_XI_22N283W_070113 by the Context Camera science team. NASA's Jet Propulsion Laboratory, a division of the California Institute of Technology, Pasadena, manages the Mars Reconnaissance Orbiter for the NASA Science Mission Directorate, Washington. Lockheed Martin Space Systems, Denver, is the prime contractor for the project and built the spacecraft. The Johns Hopkins University Applied Physics Laboratory led the effort to build the CRISM instrument and operates CRISM in coordination with an international team of researchers from universities, government and the private sector. Malin Space Science Systems, San Diego, provided and operates the Context Camera.